Ladies and Gentlemen, welcome to the third giveaway here at Money Is The Root. The last two giveaways were a huge success, and I want to keep on giving back to my readers. 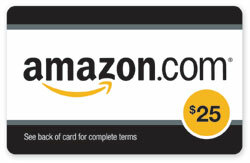 The giveaway item is going to be another $25 gift card to Amazon.com, which is great because you can buy literally anything there. You must comment on a non-giveaway post within the site, and then copy and paste that very same comment in the section below this giveaway post. You will receive 1 entry for your comment, and you can repeat this task 1 time per day. The giveaway will run for two weeks, so that will leave you with 14 possible entries should you choose to comment each day. For each of these methods, it is important that you place a comment below this giveaway post stating each action you took. Leave a comment after you “like” MITR on Facebook, and place another comment stating that you are now following MITR on Twitter, or that you now subscribe to the blog. Each one of these actions needs to be listed in a separate comment. If you already subscribe, follow on Twitter, or Like MITR on Facebook, simply note that in the comments section and you will receive an entry for each one as well. I have a lot of loyal readers, and I want them to always have the ability to enter my giveways, so please do not hesitate to enter yourself as many times as the rules permit! It is possible for each person to receive a total of 14 entries by placing a comment each day, and an additional 18 entries for the optional methods. One person can receive a possible maximum total of 32 entries into the drawing. You must complete all entries prior to 11:59 PM Eastern Time the night of August 24th, 2011. The winner of the giveway will notified by email on August 25th, 2011. The winner will have 3 days to contact me via email/contact form and accept the prize, otherwise there will be a redraw for a new winner. The winner will be chosen via the plugin And The Winner Is. This plugin is totally random, and will select 1 winner based on the comments below the giveaway post. This is why it is vital that you leave a separate comment for each entry you perform. I will comb through the comments to make sure they are not being misused.